Dameron Berardi’s mother, Emily Berardi, and Dameron at the award ceremony. KENNETT SQUARE — Kennett Consolidated School District students are known for their community involvement. Whether it is accepting a leadership role or going the extra mile to make a difference, such dedicated students make the district proud, officials say. One of the district’s most dedicated students is junior Dameron Berardi. 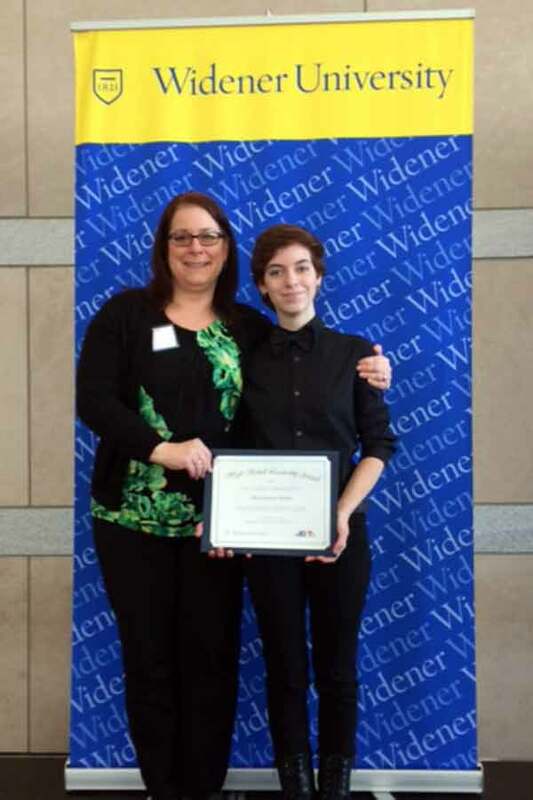 Dameron was recently awarded the 2016 Widener University High School Leadership Award for standing up for what is right, addressing a wrong, and making a difference in the community. As one of the 159 recipients of the Widener University High School Leadership Award, Dameron will receive a $20,000 scholarship, to be awarded over four years if Dameron chooses to enroll at Widener. Teachers across Pennsylvania, New Jersey, and Delaware were asked to nominate students who demonstrated an essential attribute of leadership: courage. Kennett High School English teacher Ms. Kelly Virgin said she was proud to have nominated Dameron for this honor. Dameron’s efforts included meeting several times after school to draft and revise a proposal, which was presented to the principal, the district superintendent, and faculty. Dameron also met with the principal to discuss the need and made a presentation at a faculty meeting. As a result, the 2016–17 school year started with two new gender-neutral restrooms. This year, Dameron was voted in as vice president of the Gay-Straight Alliance and has organized several socials and a week-long educational campaign aimed to raise awareness about transgender issues.